Serious players in grades 6-11 are invited to attend. Workouts are free. Click here for directions. East Coast Fusion has already helped save players and their families over $10,200,000 in college expenses? Become the next player to earn a scholarship! Last chance...final tryouts for the 2014 Travel Teams in Virginia will take place on Saturday, March 22nd at The Miller School of Albemarle. All players trying out must bring the attached form and a $10 tryout fee to the event. The times for tryouts are below, directions to the gym can be found by clicking the Teams link above. Contact Coach Dalton if you are unable to attend the final tryout. There will not be any teams for the New York program this season. Why is East Coast Fusion potentially the best fit? There are so many options for places to play during the spring and summer. Depending on your grade and what your goals are, East Coast Fusion might be the perfect program for you. Click here to find out more about what the East Coast Fusion program has to offer players in the New York and Virginia area. February 10, 2012 - Over the last 8 years, the East Coast Fusion program in Virginia has evolved from a program that catered to the needs of the greater Charlottesville community, to a program that reaches players and families throughout the state as well as Washington DC, West Virginia and North Carolina. "If someone told me back in 2004 that we would have players and coaches willing to travel upwards of 3 hours to come to workouts and practices, I would have laughed" said Program Director Cade Lemcke. Read about all the details by clicking here. 2013 marks the 10th year that the East Coast Fusion - Youth Development Program has been mentoring young players and helping them maximize their God-given potential both on and off the court. None of this could have been possible if it wasn't for the unbelievable support from the players, families, high school coaches and local businesses in the communities where our programs exist. Throughout this year we will highlight key people who have helped make Fusion what it is today. The 9th Annual Fusion Hoops Festivals are set for this coming up spring. The tournament will include Boys and Girls divisions, U13 - U17. The Virginia Hoops Fest will take place on March 23rd & 24th (Saturday/Sunday) in Charlottesville, VA. The New York Hoops Fest will take place on June 1st & 2nd (Saturday/Sunday) in Rochester , NY . Following the 2010 East Coast Fusion summer tourney schedule, Ben Dickinson was feeling a lot of love from Division I schools around the country. Binghamton University (America East Conference) put the fullcourt press on Ben and he found himself committing to the Bearcats soon after his senior season began at Gonzaga High School. Little did everyone know that his time spent at Gonzaga and playing with East Coast Fusion would prepare him to be able to make an impact right away at BU. Ben broke the school record in his first collegiate game against Colgate. He tallied 27 points on 7/13 from the floor and 11/14 from the line. He also had 7 rebounds, 2 assists and 3 steals. Read Matt Whitrock's story about Ben's performance by clicking here. 8 East Coast Fusion players signed their scholarship papers during the early signing period in November. Click each player's name below to read their story. 6-8 more players will be signing their LOIs in April, along with 14-16 other players who will make their college decisions known. Congrats to all of the Fusion players' and their families during this joyous time! 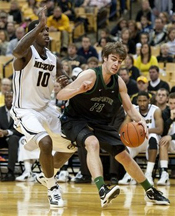 Fusion alum, and Rochester native, Ryan Hage enrolled at Fordham University of the Atlantic 10 Conferemce back in 2008. Little did anyone know that over the next four years he would tryout and make the Fordham squad, earn decent playing time beginning in his junior year, earn a scholarship for his senior year and be named team captain. Oh yeah, all while carrying a 3.5 GPA and majoring in Business Administration. Read the full story from the Genesee Valey Penny Saver by clicking here. Jerome Hairston moved from Wyoming to Virginia to increase his national exposure and possibly get to a high-major school. The plan has worked so far - just ask his cousin, former Wake Forest star and current NBA player, James Johnson. "He said, 'it's crazy - you're just as good as the guys you've seen on YouTube and stuff. And now you're one of them,'" Hairston said. "We didn't think we were as good as some of these other guys," he added. Read the entire story by Jeff Borzello by clicking here. East Coast Fusion had two players participate in the NBA Player's Association Top 100 Camp. Jerome Hairston and Jordan Burgess both represented themselves and East Coast Fusion well over the course of the week. Their squads finished 1st and 2nd during "regular season" play and had good runs in the playoffs. This event is well-attended by the some of the biggest names in scouting services and recruiting media outlets. Find out more about the exposure these player received by clicking here. East Coast Fusion TISA had a great showing in one of the nation's premier events over Memorial Day Weekend. The Gym Rat Challenge had 96 teams compete in the U17 Division. Fusion fell in the quarterfinals to eventual runner-up, Sports U Team Izod out of New Jersey. Several players earned All-Tourney Honors at the event; Torrence Dyck, Matt Hart, Deyshawnee Much, Jonah Brooks and Jonathan Blythers. Click here for more info. East Coast Fusion U17 move up the national rankings to #22 after winning the Southern Invitational. This national poll includes every travel team in the country; all 38 Nike-sponsored teams, all 25 Adidas-sponsored teams and the various teams who have merchandize relationships with Reebok, Fila, Under Armour and Pony. East Coast Fusion remains as an unaffiliated program and are proud to be one of only three teams in the Top 25 who don't have a sponsorship or merchandise relationship with any footwear company. See the rankings by clicking here. After a good showing by all of the Fusion teams that competed in Hampton (VA) at the Southern Invitational, three players were given interviews about their play. These interviews can be found in their entirety by clicking here. One of the East Coast Fusion U17 teams wins the Gold Championship at one of the spring's most prestigious events, The Hoop Group's Southern Invitational. Fusion LEMCKE beat some of the most respected teams in the country enroute to the tournament win including; Connecticut Select, Team United, Team Takeover, and others. The championship game included a matchup with the Russian Junior National team which was over in the USA for a 9-day training camp. Read the full media coverage of East Coast Fusion's win by clicking here. After a good showing by all of the Fusion teams that competed in the Pitt Jam Fest, three players were given interviews about their play. These interviews can be found in their entirety by clicking here. Congratulations to all of the teams who competed in the Virginia Hoops Festival. There was a lot of talent in Richmond (VA) for the event and it was a great environment. Click here to see the results of the tournament. The New York Hoops Festival is scheduled for June 4th and 5th, click here for more info. Here is a story about a Rochester post player who became involved with East Coast Fusion this past spring. "It would have been so much better for Josiah if he would have joined the program 2-3 years earlier, but it's never too late to develop your game and get the proper exposure to college coaches," said Joe Tisa (Fusion NY Director and U17 Coach). March 21, 2011 - The 6-foot-8, 230-pound senior center from Irondequoit gave a verbal commitment to the Golden Griffins on Friday night, opting for Canisius over Le Moyne and Mercyhurst. Quinnipiac and Robert Morris were other...Click here to read more. Labanowski Named an Academic All-American! Here is a story about an original East Coast Fusion player, Mike Labanowski. Mike is a senior guard at the University of Rochester and he was just selected to the CoSIDA Academic All-America Team. February 21, 2011 - As a three-point shooter for the men's basketball team at the University of Rochester, Mike Labanowski has done an admirable job of "filling it up". The nomenclature describes his ability to put the ball in the basket. Academically, Labanowski has done an admirable job of "filling it up" as well and he has been rewarded appropriately. The senior...Click here to read more. Click here to read the full press release from the NCAA. Fusion coach Jason McElwain recently was back on the Today Show letting the world know what he is currently doing. J-Mac is a passionate and dedicated member of our New York program. Click the link to watch the video. Here is a story from Virginia Preps (part of the Rivals.com network) about current Fusion player Nick Coppola. January 6, 2011 - After starting every game last season as a freshman for Central Region quarterfinalist Cosby High School last season and garnering all-academic honors in the Dominion District, Nick Coppola (5-foot 11, 175 pounds) has been even more impressive and taken his game to another level, as a sophomore this season for a Cosby team...Click here to read more. Here is a story about the group of five seniors at Canisius College in Buffalo , NY. Two of these players are Fusion alum, Greg Logins and Tomas Vasquez-Simmons. 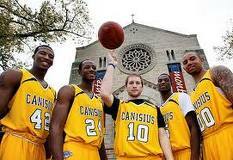 May 22, 2010 - Tom Parrotta laid out his demanding academic acceleration paty for the Canisius College men's basketball program starting with his first recruit: attend both sessions of summer school each year and you finish with four years on the court and a master's degree. Four years later, guard...Click here to read more. Here is a link to a story from WXXI (Rochester media outlet) about what former Fusion coach, Anibal Soler, is doing to transform East High School. Mr. Soler was named the principal at East HS back in 2009. He is trying to incorporate a merit pay system for the teachers at East as a way to improve test scores and graduation rates. Here are the details. Click here for why you should be involved with East Coast Fusion! Got any great sites that you think we should post? Let us know!